Acknowledged author Richard J. Larsen wrote An Introduction to Mathematical Statistics and its Applications comprising 752 pages back in 2017. Textbook and etextbook are published under ISBN 0134114213 and 9780134114217. 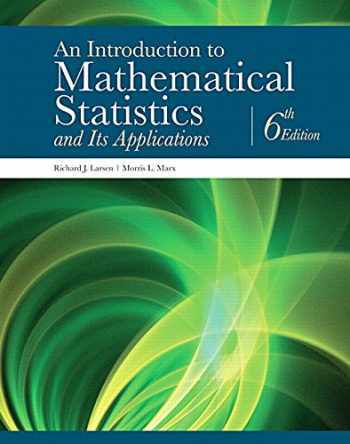 Since then An Introduction to Mathematical Statistics and its Applications textbook received total rating of 4 stars and was available to sell back to BooksRun online for the top buyback price of $75.94 or rent at the marketplace. For courses in Mathematical Statistics Introducing the principles of statistics and data modeling Introduction to Mathematical Statistics and Its Applications , 6th Edition is a high-level calculus student’s first exposure to mathematical statistics. This book provides students who have already taken three or more semesters of calculus with the background to apply statistical principles. Meaty enough to guide a two-semester course, the book touches on both statistics and experimental design, which teaches students various ways to analyze data. It gives computational-minded students a necessary and realistic exposure to identifying data models.